"I will take what is mine with fire and blood." I started watching Game of Thrones back in 2011 when the first season was released and instantly fell in love, it was everything I ever wanted from a TV show. I then delved into the ASoIaF books and they are now some of my all time favourites! Despite my enjoyment of the show dropping off from season 5 onwards (the writing just isn't as good), I still enjoy it and really wanted to make some of the characters from the show. 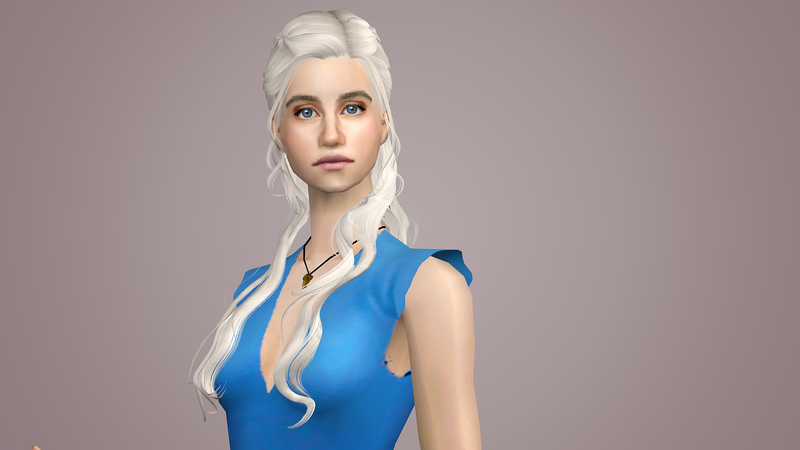 I've been slowly making my way through the cast of Game of Thrones and am finally happy enough with my Daenerys sim to consider her finished. Emilia has such a cute little face, so it was really a joy to try and recreate her in TS2. The hair mesh by Newsea (converted by Rented Space ) has been included! The necklace textures are by me, on a mesh by Dr. Pixel. You will need to download the necklace mesh, which has been included in an upload here. 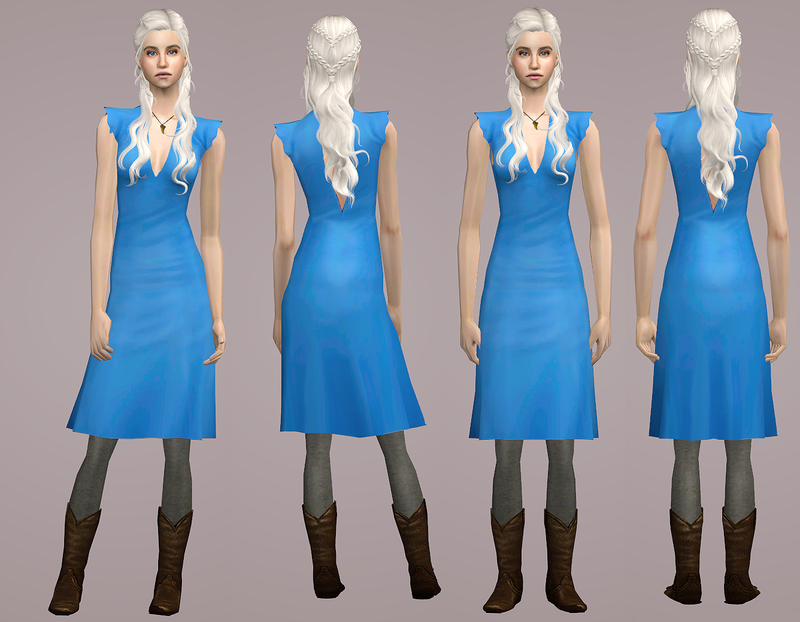 The Skinblend I have used on Daenerys is by me and is available on my tumblr here (along with preview images). It contains textures from Needlecream, Lilith, Mouseyblue, Trapping and Adalae. 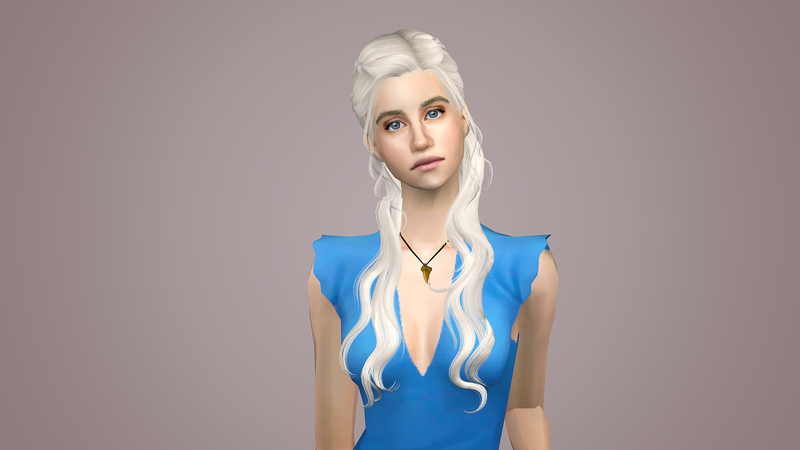 For recolours of Dany's Eyebrows, Eyes and Lipstick please visit my tumblr here! The 'Stormborn' Dress (which is an interpretation of her dress worn in season 3) is a frankenmesh by me, it is made up from the following parts: io's Dainty Skirt Mesh Edit, Amaryll's RuffleBlouse Top Only by Trapping, and Yuxi's 3t2 Cowboy Boots. There are eight recolours, created using actions by Poppet. The textures are from a combination of creators: Amaryll , Trapping and EA. I hope you have fun conquering Westeros with Daenerys! Thank you MTS for choosing this as a picked upload! 2. Extract: Use WinRAR (Windows) or Stuffit (Mac) to extract the .sims2pack file(s) from the .rar or .zip file(s). 3. Install: Double-click on the .sims2pack file to install its contents to your game. The files will automatically be installed to the proper location(s). You may want to use the Sims2Pack Clean Installer instead of the game's installer, which will let you install sims and pets which may otherwise give errors about needing expansion packs. It also lets you choose what included content to install. Do NOT use Clean Installer to get around this error with lots and houses as that can cause your game to crash when attempting to use that lot. Get S2PCI here: Clean Installer Official Site. You did an amazing job! Thank You! She is amazing! She is so well done, I would recognize anywhere. I am speechless! -SciFi Starter Families- Get the Paranormals HERE!